Eco spaces and eco gardens are the future of cities. As more cars fill up the streets, more condo buildings tower above us and pollution becomes more prevalent than ever before, cities around the world are searching everywhere and anywhere to create more green spaces. Some cities around the world have hopped on board earlier than others and have created beautiful eco spaces and eco gardens for their residents. With space as the greatest barrier, these eco spaces are not only extremely creative in design, but both innovative and inspirational for other cities. Blurring the lines between urbanization and nature, these 10 eco spaces are the future of green spaces in even the most densely populated cities. Architect, Vo Trong Nghai, and his firm designed this sustainable kindergarten so children can learn sustainable habits. The entire roof is covered with a vegetable garden to teach the students how to grow their own food, while the garden also works as insulation for the building. The eco space doesn’t stop there as its water is heated by solar energy and the garden and grassed areas are watered with recycled waste water from a neighbouring factory. Italian architect Stefano Boeri and his firm is behind the innovative vertical forests in Nanjing, which will be finished by 2018. The two skyscrapers, which are basically vertical forests, will absorb 25 tons of CO2 per year and produce 132 pounds of oxygen per day; in other words, these eco spaces will provide enough oxygen for about 84 people per day. The vertical forests will also be filled with commercialized spaces, like offices, a restaurant and a museum. Created by Michael Van Valkenburgh Associates, this urban park located around the Trinity River will be 10 times bigger than New York City’s Central Park. While one major initiative of the park is to protect the city from major flooding, the park will also restore ecological function and of course provide a beautiful eco space for residents. Certain parts of the park are completed while others are still a work in progress. The Enabling Village, created by the Singapore-based architectural organization WOHA, was created from a local building that had been steadily crumbling for decades. Using recycled materials, the company created an eco space that blends architecture with the surrounding nature. The Village is a community and an eco space that was also designed completely accessible for those with disabilities. Spark, an architecture firm, proposed their plan called Homefarm, which is a health, housing and farming concept that revitalizes the idea of urban retirement. This eco space would be in place of a regular, stuffy retirement community. This would instead offer residents a space for living and another for farming. The home will increase local production of fruits and veggies with its wrap around structure that holds a large courtyard and an aquaponic vertical farming system. The eco space will collect rain water and treated grey water, fish waste will provide nutrients to grow produce and agricultural waste will be fed into an onsite biomass power plant. Spark hopes to see the first instalment of Homefarm by next year. 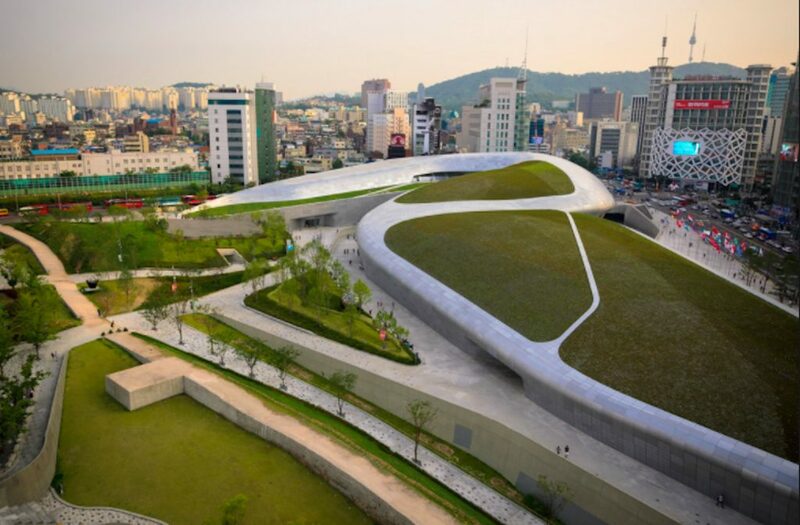 Designer Zaha Hadid had the right idea with the innovative creation of Dongdaemun Design Plaza & Park. Instead of a standard shopping plaza, the designer used futuristic designs to implement an eco space into the design. Complete with lotus ponds, bamboo groves, reflective ponds and rolling green hills, the eco space is integrated with office buildings, a design museum and convention facilities. Ushida Findlay Architects recently got permission to build this eco space. The sustainable, multi-family compound will be solar powered, have a heavy focus on natural light, it will be built with locally-sourced materials and arguably most significantly, it will have an undulating green roof that connects five individual four-storey homes. The homes will share recreational areas and will have a low carbon footprint. This innovative design sets an example on how to combine eco spaces with homes. After 25 years of work, this year will be the year Canadians can finally hike along The Great Trail. The Trans Canada Trail Foundation will be completing one of the world’s biggest trails this fall. 80 per cent of Canadians live within half an hour of the some part of the trail. This eco space is 24,000 kilometres in length, making it an innovative way to connect Canadians and bring locals and tourists alike out into nature. Missouri will soon be home to a car-free 400 mile loop for hiking and biking. This eco space makes it possible to get from Kansas City to St. Louis by foot or bike, without having to ever see a car. This eco space is big news for Windsor as it will bring employment and tourism to the city. The new eco space will bring locals and tourists alike together to camp, bike and hike along the route. This eco garden is rare because not only does it offer a unique eco-friendly rooftop in a busy city, but it’s also a homeless shelter. The eco garden is completely grown and maintained by its residents. Beginning in 2009 the garden’s first harvest produced 55 pounds of produce and since then has expanded into 80 garden beds. This eco space also has a beehive and harvests rain water. This innovative eco garden acts as both an environmentally-friendly initiative and an educational one.